The 18th Annual Space Coast Birding and Wildlife Festival ended as it usually does with an all day pelagic tour on the Atlantic Ocean, east of Ponce Inlet. After a day of calm and sunny weather, another cold front whisked through the Space Coast and threats of gale force winds and high seas left the trip in doubt. The captain of the boat, The Pastime Princess, determined that if we stayed relatively close to shore, we’d be spared most of the high seas and some of the wind. It was decided that we’d head north, parallel to the coast, and see what we could see. It was just too treacherous out on the water much further out. This change in plan meant that many of the birds we might see – shearwaters, skuas, etc. – would be blown out to sea. But in return we ended up with a few surprises we might otherwise have missed. Each year we are hopeful that we might see Northern Right Whales, since the waters off north Florida are part of their calving area. We had some hints of them last year, but nothing definite. 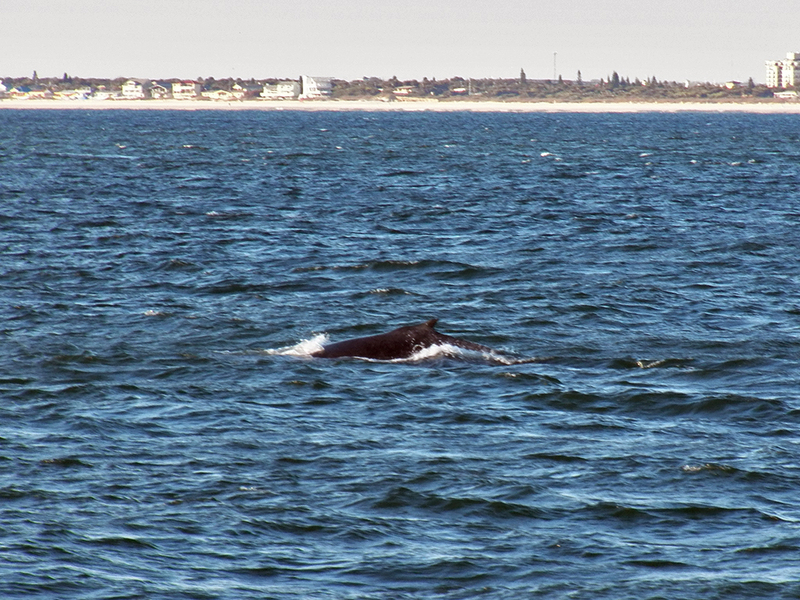 This year, we definitely had whales, but it turns out one of them at least was a Humpback Whale! 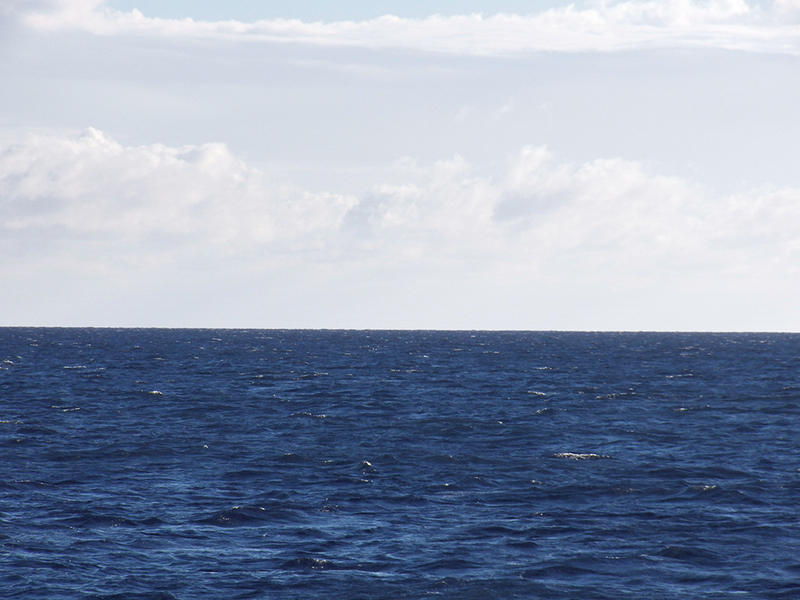 The others were likely a species of beaked whale. We had numerous spouts and even some flukes shown when the whales dove. 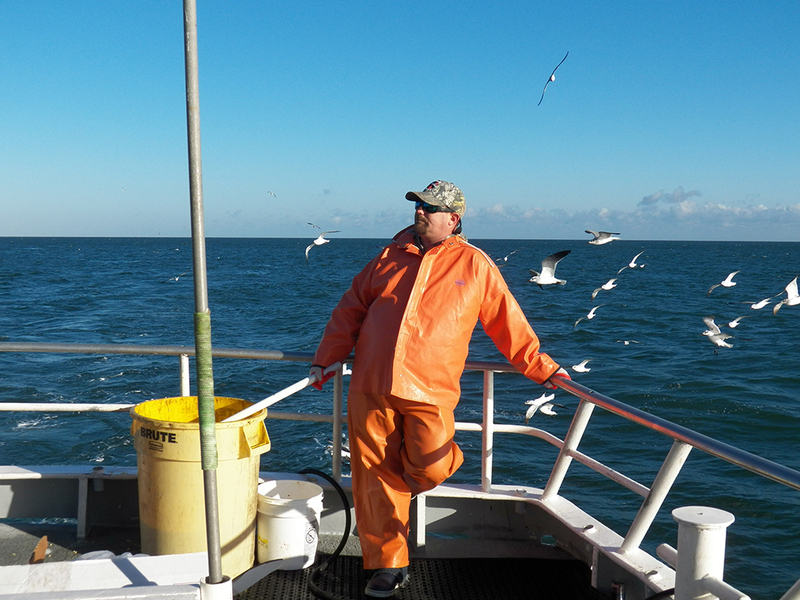 The wind was brutal, so I tried to stay on the side of the boat most protected, which was sometimes a challenge as the captain turned the boat to get closer to either a whale or a group of birds. If what we were looking at was into the wind or on the windward side, it was tough to keep the binoculars or camera still. The seas, surprisingly, were not that rough close to shore. We only had a few incidents where the boat pitched enough to have to really hold on. Our goal was to find some shrimp boats. The shrimp boats have thousands of following birds waiting for the nets to be brought up so they can grab what they can. We came upon several boats in the course of the day. 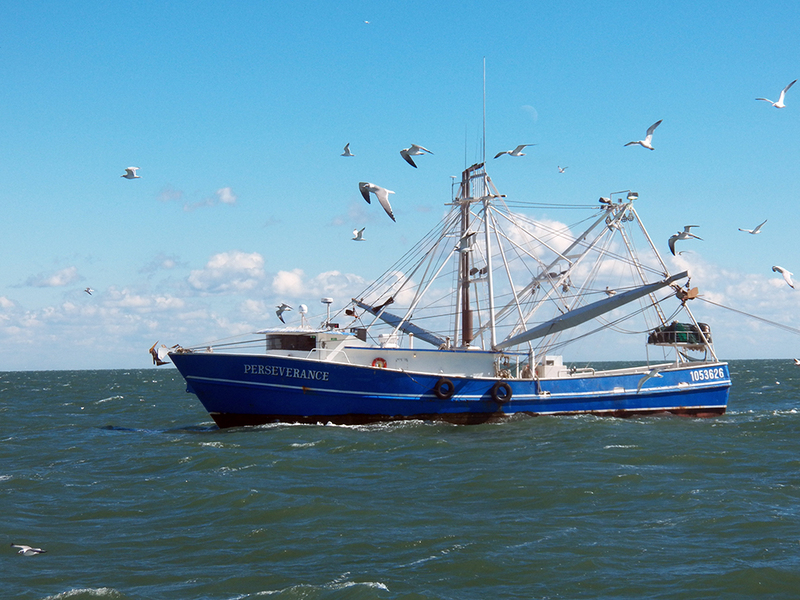 A typical small shrimp boat. To entice the birds away to an “easy meal”, one of our boat’s mates would ladle chum – in this case a mixture of popcorn, fish and fish oil – over the back of the boat. As you can imagine, the chum smells horrible, so it’s best to be careful near the stern while someone’s chumming. 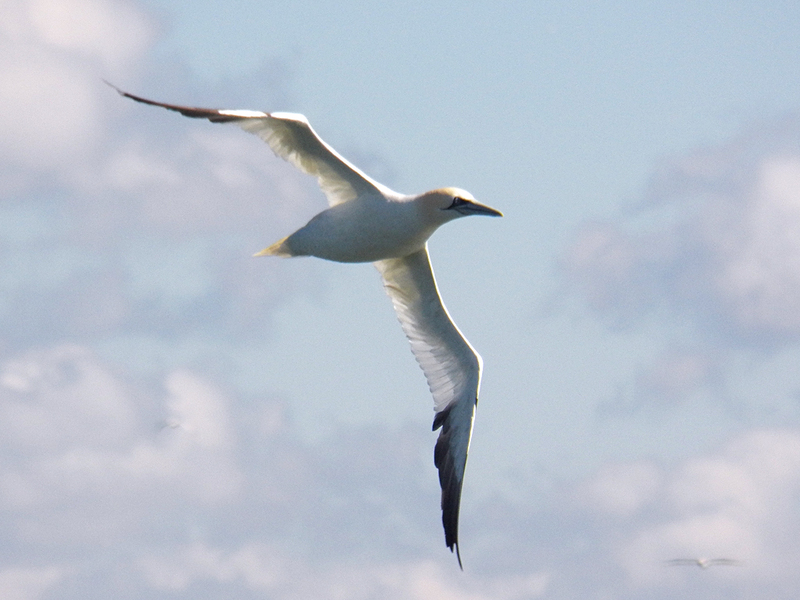 Besides the numerous gulls, we saw thousands of Northern Gannets in the course of the day. It takes 4 years for gannets to achieve adult plumage, and we saw all 4 stages in about equal numbers. Gannets dive straight down into the water to grab fish, their streamlined bodies ideally suited to the task. They are also graceful flyers, with long wings allowing them to glide great distances to find food with minimal effort. Northern Gannet at dawn, showing nearly full adult plumage. Brown Pelicans also followed our boat and took advantage of our chum. Normally these pelicans dive for fish (unlike their cousins, the American White Pelicans, who sit at the surface and scoop up fish). 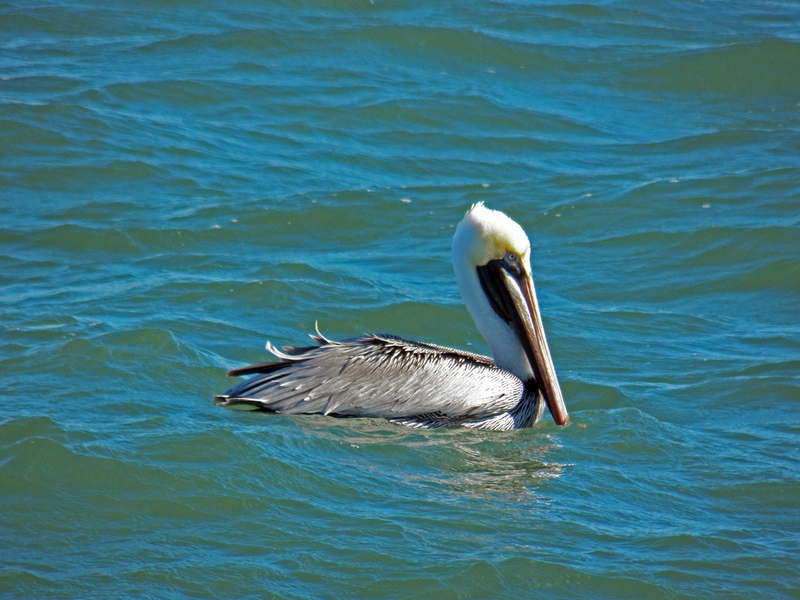 I learned that unlike the gannets and other diving birds, which dive straight in, Brown Pelicans turn their bodies and head at the last second before striking the surface, minimizing the shock to their necks. This may be an adaptation to compensate for their large heads and bills in proportion to their bodies. Adult Brown Pelican resting after getting a nice meal of fish parts and popcorn. 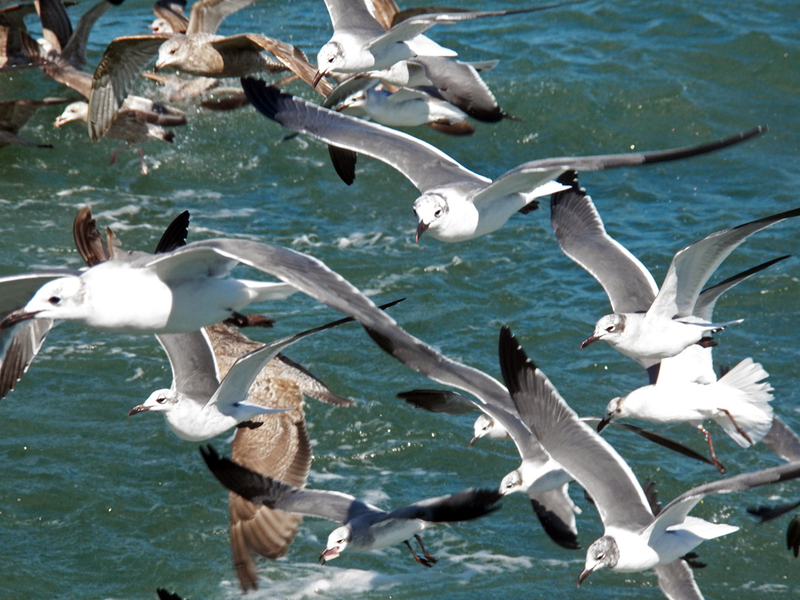 Gulls have adapted to be opportunistic predators and scavengers. They rush in to grab whatever they can as soon as possible. This is why gulls are often present in large numbers at garbage dumps. Sometimes they bite off more than they can chew (metaphorically – most birds cannot chew). I don’t think this Laughing Gull knows or cares that it probably cannot swallow this fish head. Whenever there are gulls feeding, you’re sure to find jaegers. Jaegers are swift-flying predatory seabirds that chase other birds to get them to either drop or regurgitate their food. We had jaegers (both Parasitic and Pomarine species) throughout the day, though I personally only identified a handful of Parasitic Jaegers. I had a hard enough time trying to get my binoculars on these birds, never mind my camera, so kudos to those that got some great jaeger shots this trip! Eventually we turned out of the wind and headed back to the inlet and to port. Another fun pelagic trip in the books, and I am really looking forward to doing it all over again! The species list might look a bit thin to some, but I’m glad for each and every species and individual bird we saw this year. In all, I had a lovely time at the festival this year. I met some new people, learned new things and most importantly saw a variety and number of birds I’ll be thinking and talking about all year. 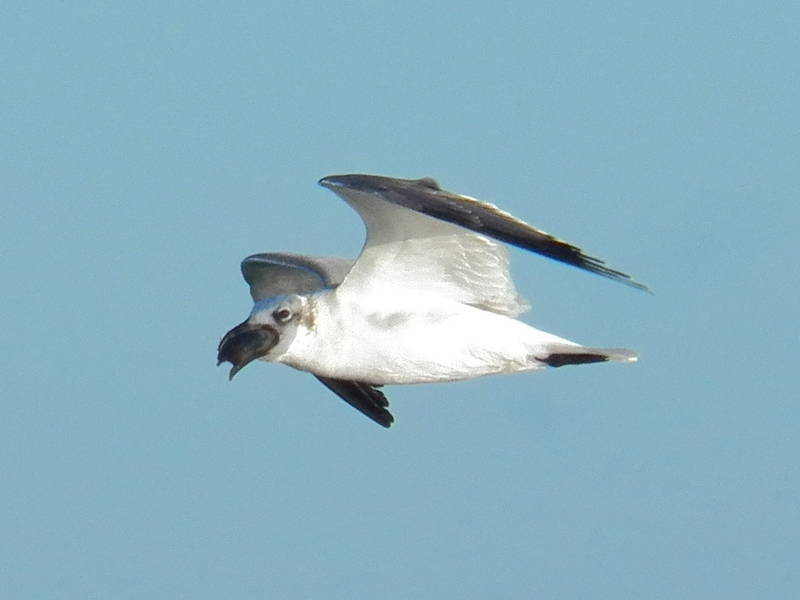 Posted on 2015 February 7 2015 February 7 by Lonely BirderPosted in BirdingTagged Pelagic Birding Boat Trip, Space Coast Birding and Wildlife Festival.